For over 50 years the Art Guild of Pacifica has supported, nurtured, and exhibited art in Pacifica, enriching the coastal community. The AGP sponsors four themed gallery shows annually, plus a members-only exhibition and award winners’ show, and a December holiday art show and sale. Come celebrate the arts at the opening reception for AGP’s 56th Annual Members Exhibition on Friday, October 17, 7–9 pm. Music will be provided by Vivacé. In the Main Gallery are the 55th Exhibition Award Winners, selected by Skyline College professor artist Amir Estafani and curated by Jamey Brzezinski: Leah De Nola, Thomas A. Ekkens, Alan Firestone, and Dan Underhill. This For the first time ever, the exhibition award winners will give an artists’ talk at the close of their show. This free lecture/discussion is scheduled at 4 pm on Sunday, November 16, and will be preceded by Sanchez Studio Artists’ Open Studios from 10 am to 4 pm. Leah De Nola is a San Francisco based artist whose award-winning acrylic painting is titled Me, Myself, and I. In addition to her figurative work, De Nola’s paintings and prints include landscapes and abstract explorations of lines and color. 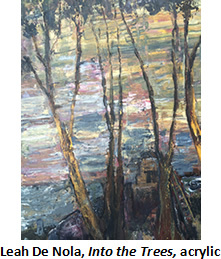 Check out this gifted artist’s work at www.leahdenola.com. 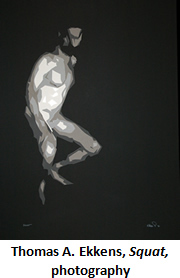 Thomas A. Ekkens’ award-winning piece is a colored pencil drawing titled Robe. Ekkens’ work includes photography, bookmaking, metalsmithing, calligraphy, and maze and labyrinth design, as well as songwriting and poetry. A consummate innovator, he has created what he calls “parsal photography” as well as “Ekkensian verse.” See his work at www.taegallery.com. Alan Firestone, a sculptor and painter, received his exhibition award for Progression, a wonderfully precise yet open-ended work with text etched on a mirrored surface. 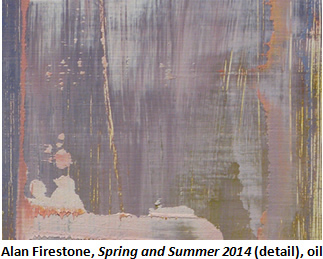 In the Award Winners show, Firestone will share his subtly textured oil paintings, in which multiple layers create a feeling of depth and new growth. See more at www.alanfirestone.net. Dan Underhill (www.dan-b-underhill.com) received his award for Further Conversations with the Messenger (block/monoprint with acrylic). Underhill has a uniquely honed sensibility regarding life, the earth, and our place in and on it. His blockprints convey breadth, depth, and humor, and speak to the way the human soul is linked to all that is. No small achievement! Robert Poplack, Director and Curator of Wiegand Gallery, and Associate Professor, Department of Art and Graphic Design, at Notre Dame de Namur University, will select award winners for next year. In addition to seven Merit Awards, Mr. Poplack will designate four artists to receive Exhibition Awards for 2015. Sanchez Art Center is located at 1220 Linda Mar Boulevard in Pacifica, 1.5 miles east of Highway 1. Parking is free. Following opening night, galleries are open Friday, Saturday, and Sunday, 1–5 pm (and by appointment) through November 16. 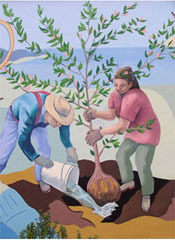 For information about AGP membership, visit www.artguildofpacifica.org.